As I look back on the TRULY WASTED EIGHT YEARS of lyin’, golfin’, arrogant Obama ‘managing America’s decline’, I realize that it wasn’t so much a management of the decline as a lulling of the populace into demoralized submission to our new global overlords (Central Bankers, United Nations, Multi-Nationals via TPP, etc.) whose public face is the one and only, never to be forgotten for her multiple media blacked-out and shadow government covered war crimes, Hillary Rodman Clinton. A more loathsome sub-human is yet to walk this planet, IMHO. 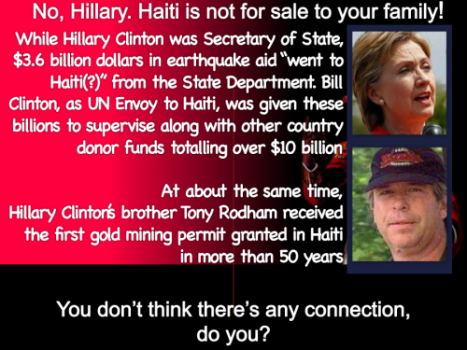 As she has looted the poor island nation of Haiti from the devastating earthquake 6 years ago to her continued looting by using the Clinton Foundation to funnel money into her personal coffers via the latest hurricane tragedy, we are now looking at a possible future for America with the ‘walking dead’, wicked witch, perpetual thief, liar, and murderer as our president. I have met and known sub-humans as evil as Hillary Clinton, but none of them had this kind of power for this amount of time with the possibility of nuking the entire planet as some kind of personal vendetta or blood sacrifice. Also, none of them had the unbelievable ability to make the lies, subterfuge, and absolutely insane ideas (late term abortions) seem so reasonable and rational as the beast in the oven mitt. What you are about to view is a news report from billionaire Gary Heavin who has personally and financially helped the Haitian people since the earthquake, and is now continuing to help the ONE MILLION hurricane affected people who are without aid (even though the UN and the US military are there on the ground). Yes, you should be calling your congressman and sending the following video viral!!!! (Billionaire Gary Heavin has a personal message for the beast at 5:57). There are not enough descriptive words or phrases in any language to describe the America hating, worthless Obama and soulless Hillary. If America is stupid enough to elect Hillary Clinton or let this election be stolen or delayed via some EO from Comrade Barry, then I supposed we and the rest of the world deserve whatever happens next.